"If the truth comes out (about ET disclosure) it will be the biggest thing in human history, the most spontaneous shift we have ever seen. Everything is going to change in a dramatic way." "Imminent Future Changes: Hear David on Coast and a New Audioblog!" Welcome to the Miracles and Inspiration conference call for October 13, 2009. We are your hosts, Scott Mowry and Dan Rezac. We have some very new and exciting information to cover tonight so we are happy you have joined us. Tonight we going to discuss some of the incredible new predictions and prophecies from David Wilcock. These are some of the most dramatic, powerful and amazing messages he has ever given in his entire life and we are going to cover them in great detail. Then during our second hour tonight, we are going to play some Solfeggio Frequencies music for you that we think you will really enjoy. We want to remind you that we do not do our conference calls on a regular basis so the best way to keep abreast of when the next call will take place is to sign up for mailing list. And if you wish to do this, you can send an email to info@miraclesandinspiration.com and put "subscription" or "mailing list" in the subject line. Or you can check our News section regularly or our Conference Call section where will post the date and details for our next call. OK, so the first thing we want to do tonight is to hear Dan's invocation. It is not necessary to know all the answers. It is not even necessary to know all the questions you might ask. All that is required is that you know that you are not alone, that you are surrounded by the hosts of heaven, by angels and spirits, by love unbounded, by caring and attention. Know that you are deeply loved. Go ahead, walk your life. Walk it as a man or woman walks, solid and centered, true to his or her own truth. Walk it making choices and decisions, being as brave as you can be, opening doors and saying yes, trying new things, being open to the newness that flows uninvited from the world. Hold your head high and do your very best to shine out unafraid as you travel the path that is laid out in front of you. And as you walk, be certain of this one thing: you are surrounded by love, by help and guidance. At any moment, you can take a deep breath and ask: What shall I do now? How shall I handle this situation? How shall I face what I fear is behind that door? And in that moment, an answer will come. Not an explanation, not a way to set your mind at ease with formulas and processes, not a map for all the steps to take. But an answer, an answer that says: Right now, in this moment, do this. And that is answer enough. For in this moment, things are as they are. It does not matter what happened to make them as they are. Right now, things are as they are. This is not a statement of despair or resignation. This is a statement of truth, of wisdom. Things are as they are. And the blessing is that there is always a response to things as they are, even if that response is to sit quietly and wait for the sun to rise another day, for the earth to take another turn, for the moon to pull the tides toward a strong and brilliant new day. Have faith in yourself and in the help that is there for you. Trust that in its great mystery, the universe knows all and that this keep knowledge, that contains all that is and is likely to be, is conveyed to you when you ask your simple question. All the wisdom in the world is contained in a single drop of water as it falls from the heavens. Hold out your hand and catch it. Watch it spread and fill your palm, then your heart, then your life. Gaze into the deep waters of grace and know that the answer is there. And what is that answer? You are loved, you are deeply loved. A lot of incredible news has developed since our last conference call and we are going to attempt to bring everyone up to date tonight as much as we can within the remaining time that we have left. We are uncertain as to how many of you have noticed this or not, but since this summer we have entered a period of hyper-accelerated evolution on the planet. It began in earnest around July of this year and we have been in total overdrive since that point. So many, MAJOR events are happening at ever quickening pace that is almost becoming a daily occurrence at this point. So I am going to ask you, can all of you out there listening tonight, feel this accelerated mode we are now in? Do you have a sense of what is going on now? Information, truth and wisdom is just pouring out from everywhere and we are really beginning to see proof positive of the many rumors we have been hearing about for years now. There is no absolutely NO question about it that we are in the MOST exciting times on Planet Earth and with each day it is becoming more and more and more amazing to see what is transpiring. One of the major sources of new exciting information has been coming from David Wilcock who began offering some very revealing information beginning at the end of June. And throughout the Summer and now into the Fall he has really ramped it up. 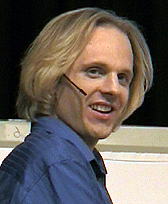 We posted a story to our News section on David Wilcock's most recent prophecies on September 20, 2009, entitled, "David Wilcock Sees Unprecedented Positive Events Unfolding Over the Coming Six Months." In that article, we tried to summarize a lot of information that David Wilcock had put out on his web site on September 11th, in a radio interview with Project Camelot on September 17th and at a conference in Los Angeles, called Awake & Aware in L.A. on September 19th and 20th. Several folks have emailed us and questioned why we should believe in what David Wilcock prophecies and we want to address those questions right now. We feel he is important for a number of reasons. Not only is he perhaps one of the most brilliant researchers, speakers and writers in the world today, not only does he offer some of the most amazing and accurate prophetic information to be found today, but if that was not enough, the most important thing he has to offer is that he is consistently positive and uplifting. There is more than enough scary information out there on the internet and from the mainstream news media about Martial Law, Planet X, 2012, the Illuminati, vaccinations, economic collapse, Barack Obama, and on and on. You can find more than enough, what I call, "doom and gloom merchants" selling you nothing but fear, despair and anxiety. But David Wilcock is one of the very few offering an alternative a very, VERY positive outlook and he does this on an always consistent basis. And he has never ever wavered from that stance. And at this stage of the game, David is really putting his neck on the line for some of the most amazing and positive events that he sees forthcoming in the very near future. So tonight what we are going to do is to play several audio clips so that you can hear David Wilcock in his own words speak about these positive events, however, we would encourage you listen to this interviews and audio recordings in their entirety, in order to get the full effect of the information that he is putting out now. The first audio clip we want to play is actually an older one from February of this year, that took place at the Conscious Life Expo 2009 in Los Angeles, California. In was taken from a 2012 panel discussion that was moderated by Sean David Morton, where David talks very eloquently about the overall big picture. The first voice you will hear is the moderator Sean David Morton asking David what he thinks will happen in 2012. Please listen carefully to David's words here and understand there is a method to all the madness you are seeing in the world today. Then on last Tuesday night, October 6, 2009, David was the main guest on the Coast to Coast AM radio program with George Noory. During this interview David dropped some real bombshells of information that were absolutely mind blowing. He added upon the already amazing information he had already dispensed on over the prior two weeks and provided even more details. We are going to play several clips from this incredible Coast to Coast AM interview that we highly recommend. Then on Saturday, October 10, 2009, David released an audioblog with yet more startling updates that was found in a post on his web site: "Imminent Future Changes: Hear David on Coast and a New Audioblog!" In this audioblog, he expounded upon his prophecies and his dreams he discussed on the Coast to Coast program four days earlier. The first clip is his further predictions about an impeding announcement of an acknowledgement of the existence of extra-terrestrials by our own government. To close out this part of our program, we would like to play a final audio clip from David that comes from the Camelot Whistleblower Radio from June 30, 2009. In this clip, David discusses something called Alien DNA and how 15% of the population possesses it which makes you interested in spiritual, esoteric and truthful interests and also prevents you from being mind controlled and programmed by the powers that be. You know that what they are telling just doesn't feel right to you. You can feel the truth! David will be appearing on the Sci-Fi channel during a special program about the year 2012, along with Richard Hoagland and other researchers. It is scheduled to air on Sunday, November 8, 2009 and will be entitled, "2012: Startling New Secrets". This show will air beginning at 9 PM to 11 PM both on the east and west coasts, and repeating again from 11 PM to 1 AM. We encourage you to support David Wilcock and visit his web site DivineCosmos and purchase some of his wonderful products like "The Science of Peace" and "Wanderer Awakening." For those who may be interested in a positive reinforcement messages, we have gathered together a lot of David's most inspiring words and messages and have put them onto CD's. These CD's represent some of David's best work from his many of his radio and video appearances. All of these selections come from interviews and presentations that are for the most part, freely available but we have edited them down to a collection of the most positive and most uplifting. We provide these CD's at a nominal cost to promote David's work and encourage others to seek out his web site and the great products he has to offer, many of which we have reviewed on our site. If you are interested in any of these CD's, please send us an email to info@mirclesandinspiration.com and we can give you more details.